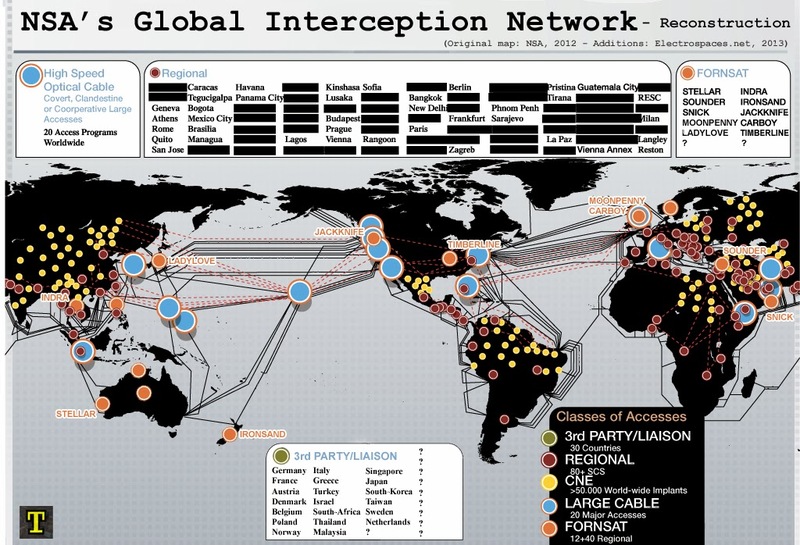 NSA's global interception network - welcome friends, how are you today? ... hopefully healthy ... starting today blog King Gadget will discuss trus information about the latest gadgets and old ones, ok now we will discuss first NSA's global interception network this information we collect from various reliable sources so that you will get complete and correct information, please read. On November 23, the Dutch newspaper NRC Handelsblad published a new slide from the Snowden documents. 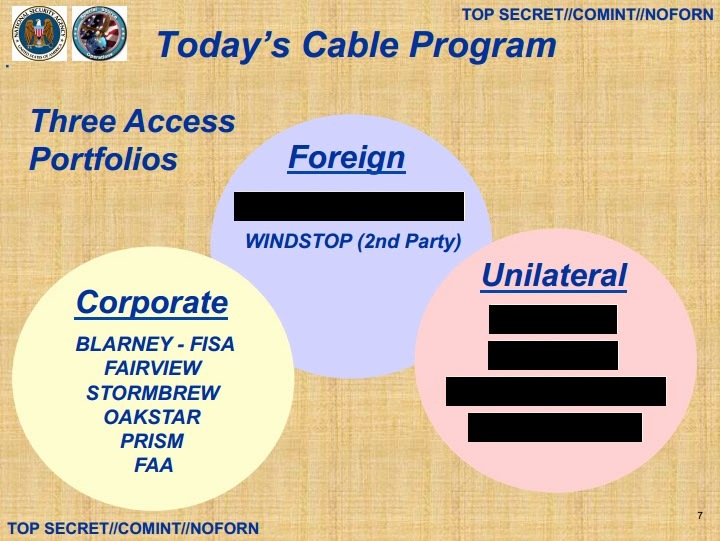 The slide is from a Top Secret NSA management presentation from 2012 and shows the agency's worldwide information collection capabilities. 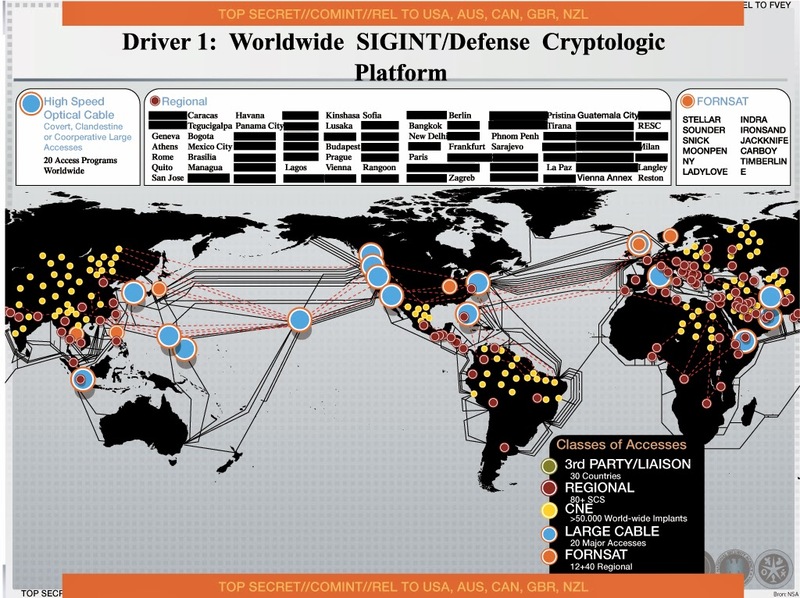 As the slide is titled "Driver 1: Worldwide SIGINT/Defense Cryptologic Platform" there must be more slides with "Drivers", but unfortunately these were not published. 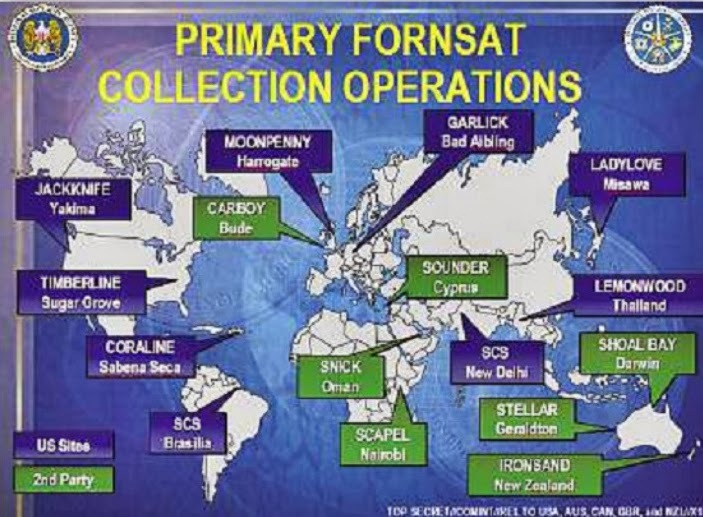 Besides the collection capabilities shown in this map, NSA also collects data through spy planes and satellites (called Overhead Collection) and a range of tactical collection systems used to support military operations. As the first class of access, the slide lists the so-called 3rd Party liaisons with partner agencies in other countries with which NSA has formal agreements for the exchange of raw data and end product reports. The legend designates 3rd Party Liaisons with a green dot, but there are no green dots on the map, which seems strange. One possible explanation could be that the different colored dots appear one by one after clicking the original powerpoint presentation, but according to a tweet of one of the NRC journalists, there were no green dots on the original map. Another possible explanation is that 3rd Party stands for countries, whereas all other dots represent specific facilities. This however could have been solved by simply listing the nations just like the Regional and Fornsat lists at the top of the map. With that not being the case, the most likely reason seems to be that NSA considers the names of these 3rd Party nations to be too sensitive to be mentioned in a TOP SECRET//COMINT document. Probably they may only be in documents classified within the Exceptionally Controlled Information (ECI) control system, just like the names of the telecommunication companies cooperating with NSA (the exact locations and even the codenames of the cable tapping facilities are also not mentioned in the map's legend). NRC Handelsblad reported that The Netherlands is a 3rd party partner too, but presented no evidence for that. According to an article (pdf) by Dutch scolars it's not very likely that Dutch agencies are a formal 3rd party partner of NSA, as they have different political and cultural views. Nonetheless, the Netherlands has always been a loyal partner in military operations and so there is regular information sharing on that level. 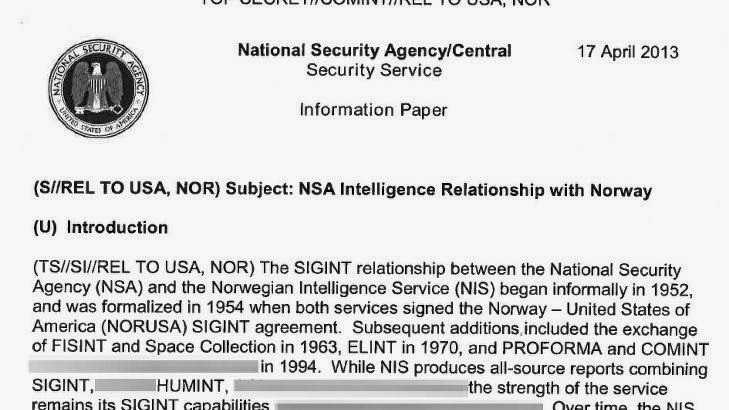 New documents show that the Swedish signals intelligence agency FRA is a 3rd Party partner of NSA since 1954. A newly disclosed document confirms that Germany, France, Spain, Italy, Belgium, the Netherlands, Denmark, Norway and Sweden are 3rd Party partners. On October 30, the Spanish paper El Mundo published an undated document showing cooperation with various countries on four different levels. The first group is called "Tier A" which is "Comprehensive Cooperation" with the UK, Australia, Canada and New Zealand (the Five Eyes). The second group is "Tier B" and is about "Focused Cooperation" with some 20 countries. The third group of "Limited cooperation" consists of countries such as France, Israel, USA and USA. Finally, the fourth group is about "Exceptional Cooperation" with countries that the US considers to be hostile to its interests. The general interpretation of this document is that is shows countries with which NSA is cooperating for Computer Network Operations (CNO), with the Tier B countries probably being a subset of the Third Party nations. The list has no date, but it does have a declassification date (20291123), which minus 25 years (the standard classification period) would mean the document is from 2004. That opens up the possibility that Tier B might actually show that in 2004 there were just 20 Third Party countries, a number which then might have raised to 30 by 2012. A strange thing about the list is that it's only classified as CONFIDENTIAL, where the text document itself is SECRET//COMINT. 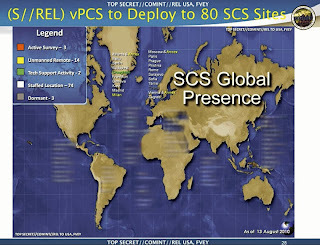 Under "Regional" the map shows over 80 locations of the joint NSA-CIA Special Collection Service (SCS) units. 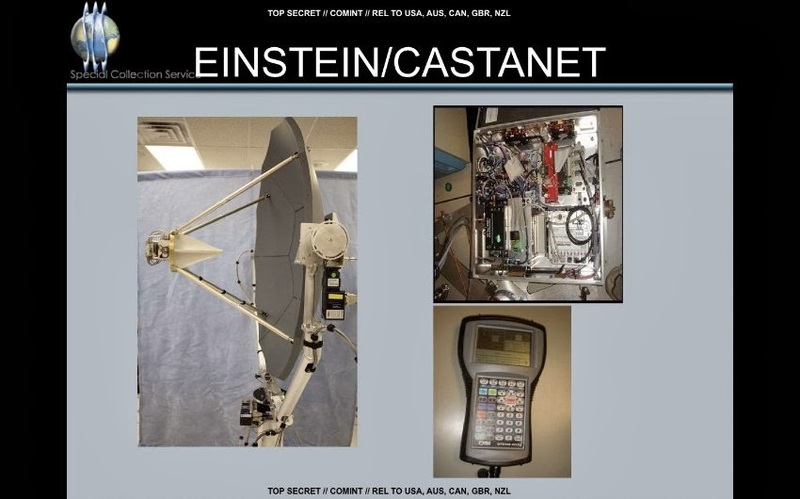 These units are covertly based in US embassies and consulates all around the world and are charged with eavesdropping on high-level targets in difficult-to-reach places, such a foreign embassies, communications centers, and foreign government installations. The names of 88 locations are listed at the top of the map, but 46 of them are blacked out. According to NRC Handelsblad, Glenn Greenwald asked them to do so, because of "protection of the source and the agreement we have with him: it's not really newsworthy". But Snowden apparently also insisted on this in order to protect his legal interests and therefore he provided Greenwald a "clear list" about categories of information that should not be published. If we compare the European cities in this map from 2010 with those in the NRC map from 2012, we see that the latter doesn't show the following places: Baiku, Croughton, Kiev, Madrid, Moscow, and Tbilisi. 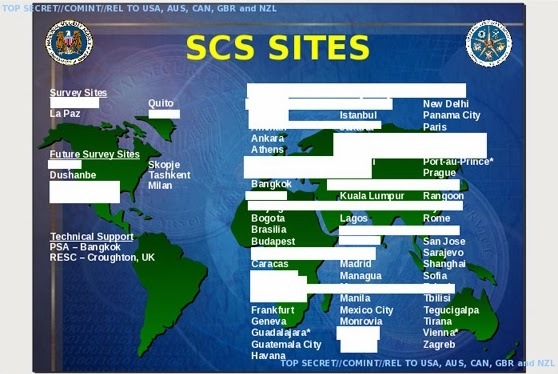 This could mean these SCS activities were terminated in the meantime, but also that their names were simply blacked out, which is definitely the case for Moscow and Madrid (having a dot on the map but not being mentioned in the legend) and seems likely for the technical SCS support facility at the US Air Force base in Croughton (or might this be "RESC" if it stands for something like Regional Exploitation Support Center?). These two locations are most likely not for eavesdropping, but rather serve as technical, training or support facilities. The headquarters of the Special Collection Service (SCS) itself is in Beltsville, Maryland. The yellow dots on the map give some indication of where NSA has placed over 50.000 implants in computer networks as part of it's Computer Network Exploitation (CNE) operations. These operations are conducted by NSA's highly specialized and secretive Tailored Access Operations (TAO) division. In 2004 NSA was managing a small network of only 100 to 150 implants. But over the next six to eight years, (TAO) recruited new hackers and developed new malware tools, the number of implants soared to tens of thousands. Based on the secret budget of the American intelligence agencies, the Washington Post reported that NSA installed an estimated 20,000 computer implants as early as 2008. Other reports indicate that meanwhile the agency has already deployed between 85,000 and 100,000 of its implants against computers and networks across the world, with plans to keep on scaling up those numbers. Compared to these numbers of implants, there's only a very small number of yellow dots on the map, so they probably provide only an indication of the regions where NSA placed most of them. As such we see USA, China, Mexico, the northern part of South-America, north-east Africa, eastern Europe, the European part of Russia and the Middle-East. It was probably TAO, maybe in collaboration with Israeli intelligence services, that developed the Stuxnet computer worm, which was discovered in 2010 and was supposedly created to attack Iranian nuclear facilities. From the Snowden-leaks we know that Tailored Access Operations uses a wide variety of sophisticated hacking tools to gain access to foreign computer networks. For example, they operate a network of secret internet servers, codenamed FOXACID, which is used to attract the traffic of targets, in order to install spying software on their computers. 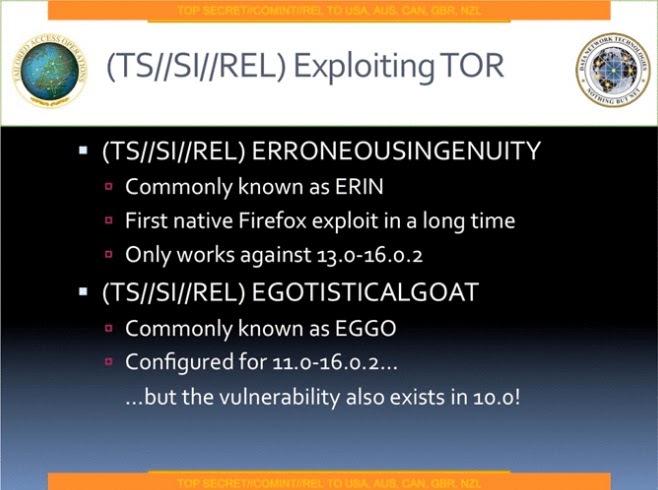 Under codenames like ERRONEOUSINGENUITY and EGOTISTICALGIRAFFE, TAO is also trying to get access to the TOR network, which enables full anonymity while using the internet. The big blue dots represent 20 major "covert, clandestine, or cooperative large accesses" to "high speed optical cable" links which form the internet backbone. It's this way that the Special Source Operations (SSO) division collects the largest share of NSA's intelligence. Maybe therefore the blue dots are the biggest ones. The map itself shows just 16 blue dots, but as the legend says "20 Access Programs" it's possible that there are 20 programs and only 16 actual intercept locations, or that not all locations are marked on the map (which is also the case for the FORNSAT locations). - one of the Caroline Islands? In most of these countries there's an American military base, which probably makes it easier to get covert and clandestine access to internet backbone cables. But as we know from earlier reports, NSA and GCHQ also have secret cooperation arrangements with major American, British and foreign telecommunication and internet providers, in order to get access to internet traffic. One supposed cable tapping location that's missing on the map is the Ayios Nikolaos station, which is part of the British Sovereign Base Area of Dhekelia on Cyprus. This station was identified by the Italian paper L'Espresso as a major cable intercept facility run by GCHQ. Most of these OAKSTAR sub-programs are "foreign access points", so maybe they, or some of them are represented by the blue dots on the map. If we add up all these Corporate, Unilateral and Foreign cable access programs, we get a total of around 20 programs, which equals the number of 20 Major Accesses mentioned in the legend of the map. division about access to "high-capacity telecommunication systems"
Finally, the orange dots on the map represent locations where there are stations for intercepting the signals of foreign communication satellites. 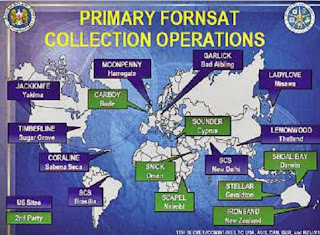 The orange dots are the second biggest ones, so maybe this indicates that FORNSAT collection provides the second largest share of intelligence. The station in Sabena Seca was closed down and the same has probably happened to the one in Nairobi. NSA's large satellite intercept facility in Bad Aibling was closed in 2004, but the agency still has a communications center in the nearby Mangfall Barracks. 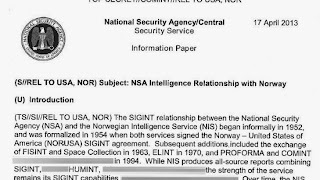 According to this document, NSA and the German foreign intelligence agency BND are cooperating in an organization called Joint SIGINT Activity (JSA), which is located at the Mangfall Barracks and conducts joint FORNSAT collection. JSA falls under the Special US Liaison Activity Germany (SUSLAG), which is responsible for the liaison with BND and is also located at these barracks. The Australian intercept facility near Darwin, Shoal Bay Receiving Station, is not in the 2012 map, but as we can see in this picture, it seems to be still operational. The same applies to the big satellite station Pine Gap. Therefore we should be careful in treating information in presentation slides and maps like this as perfectly accurate. The map from 2002 also shows two SCS locations: one in Brasilia and one in New Delhi. Apparently those Special Collection Service units also had a satellite intercept capability. This is most likely also the explanation for the number of "40 regional" FORNSAT stations mentioned in the legend of the 2012 map - which means that meanwhile half of all SCS units worldwide also conduct some kind of foreign satellite interception. The map from 2012 as published by NRC Handelsblad also has orange dots for a FORNSAT station at the Philippines and in Scandinavia. These locations were not in the map of 10 years earlier, so it seems that these are new intercept stations build somewhere between 2002 and 2012. The Scandinavian station is probably the SIGINT facility in Skibsbylejren in Denmark, which was build in 2002 (there's also a smaller and older Danish satellite station in Aflandshage). Unfortunately we don't have their codenames, because in the list in the upper right corner, there's no codename which was not already in the 2002 map. But as this list has only 10 names, and some don't fit on one line, it's possible that two names (coincidentally those of the new stations?!) dissappeared because of bad rendering. 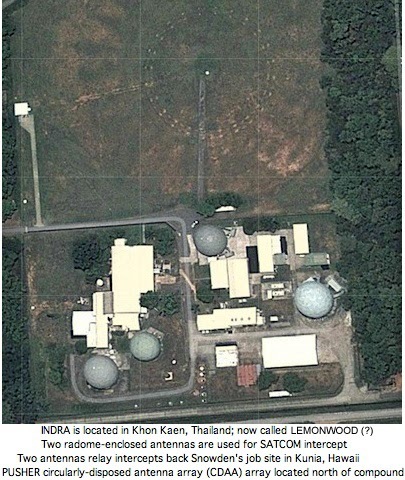 A final difference between the FORNSAT stations shown in the maps of 2002 and 2012 is the station in Thailand, which was codenamed LEMONWOOD in 2002. The location near the city of Khon Kaen was identified as being an intercept facility since 1979, but with a different codename: INDRA. This facility fell into disrepair in the 1990s and seems to have been closed somewhere before 2002. In the years following 9/11, the old station apparantly has been reactivated and expanded to an important satellite intercept mission, and appeared again under its old codename INDRA in the 2012 map. Why this place (or another one?) was called LEMONWOOD in 2002 remains a mystery. - DeCorrespondent.nl: Hoe onderschept de NSA ons dataverkeer? you just read the article with title NSA's global interception network you can bookmark for easy return visit or you can also share so this article can be more useful for many people by using link http://shwesetharrking.blogspot.com/2013/12/nsa-global-interception-network.html umpteen and thank you.